Well it looks like summer might be finally over here in PA and that means bring on soup and chili weather! I made a new soup recipe over the weekend and whipped up a batch of these muffins to do along with it. They’re not your traditional corn muffin as they have a little sour cream in them to make them soft and tender and they’re dotted with pieces of pickled jalapenos. This year my garden has been a little off. I’m getting a bumper crop of peppers, all my tomatoes ripened at the same time (even though some were supposed to be ready in early July), and my parsley and basil didn’t do well. I’m blaming it on the weather, lack of rain, and this is our first garden at our new house…need to work out the kinks. Over a course of a few days, I picked way more tomatoes than I knew what to do with. I knew I needed to figure out something to do with them, so I made 2 quarts of sauce with most of the Roma tomatoes. I still had a bunch of early girl and Mr. Stripey heirlooms to use so the next thing on my list was gazpacho. I used more tomatoes in another recipe…I’ll be sharing it later this week. I looked around for a gazpacho recipe since I had never made it before. The soup turned out amazing. I just threw it all in the blender, pureed it and then let it hang in out in the fridge while I made cornbread croutons. Seriously, it can’t get any easier than that! It makes six large portions, perfect for dinner on a hot summer night! Preheat oven to 350 degrees. Lightly spray a 9×9 baking pan with nonstick cooking spray and set aside. In a large bowl, combine the dry ingredients for the croutons. In a small liquid measuring cup, whisk together the milk and eggs. Combine the egg-milk mixture with the dry ingredients and mix until combined. Add in the chopped basil and mix in. Pour the batter into the baking pan and bake for 35 to 40 minutes or until the bread is golden brown. Allow to cool slightly on a cooling rack and then remove the bread from the pan. Place on the cooling rack to completely cool. Once cooled, cut the cornbread into the desired size of your croutons. Place them on a large baking sheet and bake for 30 to 35 minutes at 400 degrees. Stir once halfway through the baking process. Remove from oven and allow to cool. In a blender, add in the all the ingredients. Puree until there are no chunks. You might need to do this in batches. I did the tomatoes separately and then combined everything in a large bowl. Cover and place in the refrigerator for at least one hour before serving (the longer it sits, the more the flavors blend together). 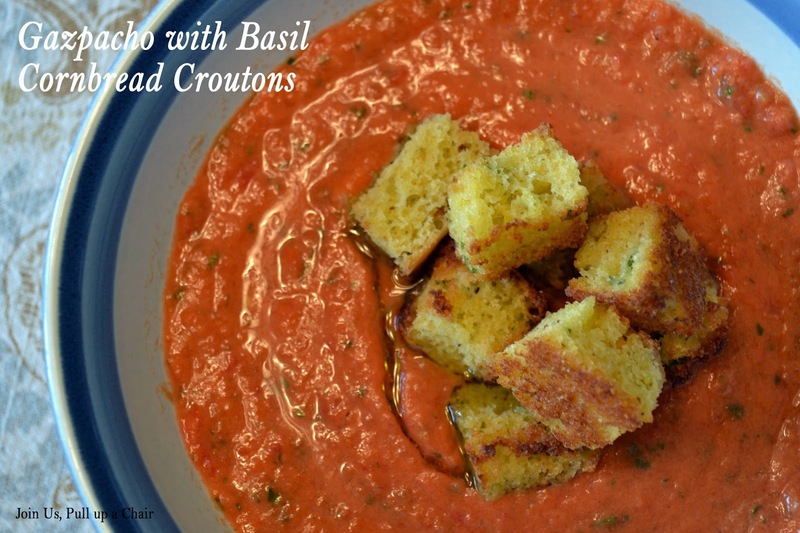 Serve with a drizzle of olive oil and croutons.